AAIC start moving. Its bullish and some collection is also happening. Probably 28/- was the turning point. Can target around 32-33 if the resistance @ 30/- is broken. This is for you serene. Well done picking a quality stock. The Invisible wrote: AAIC start moving. Its bullish and some collection is also happening. Probably 28/- was the turning point. Can target around 32-33 if the resistance @ 30/- is broken. This is for you serene. Well done picking a quality stock. So target is met with consistent buying reached 34/- today. Serene what is your idea of realizing the profits. Hurray.... AAIC reached 40/- today. So serene have you realized your gains.40% + gain within one and half months. Very good deal isn't it? So my smell is correct then. Luckily I have got on to the bus after sawing the smoke of engine start-up. No Invi. Infact I scale up AAIC from 30 to 35. So no worries on 1 to 2 Rupee fluctuations. Will wait and see the game. Ohhh that's been too much greedy mate. 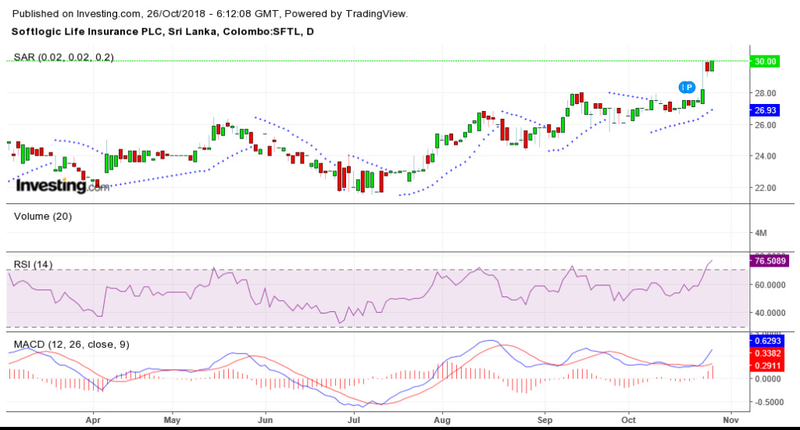 No no noooooo..
ECONOMYNEXT - A 19-percent stake in Sri Lanka's Softlogic Life Insurance has been sold by the Netherlands-based FMO to the Leapfrog Investments group, which has a focus on Asia and Africa. "This investment reveals our positive view of Sri Lanka's long-term trajectory, and its financial services industry," Leapfrog Chie Executive Andrew Kuper said in a statement. Softlogic Chairman Ashok Pathirage said exiting partner FMO helped strenghten the firm. He hoped the investment in his insurance unit woudl be the first of many investments in Sri Lanka. The stake changed hands in two blocks, one of 35.6 million shares at 30.80 rupees each and the other of 35.6 million shares at 30.70 rupees each, down 19-20 percent from the previous, opening trade. Wish that CSE will also Leapfrog after the cabinet is reinstated. Very well Compiled Half Century..